On my first day as a college freshman, I didn’t know where to go in between classes. I stayed at the library and/or waited for my next class outside the lecture halls or classrooms. I only knew a few people from high school that are on campus. Only two of that I knew I had classes with. It wasn’t until the next day that I went to the Commons building. The Commons is where the main cafeteria is for non dorming students. A place to hangout, restaurant, the school bookstore, various facilities and the game room. They have pool and ping pong tables. On one side are TVs and couches, where students could bring their gaming systems, plug it in and start playing. It was during this time when I met friends from the gaming crowd. Everyone was very welcoming. We were all very passionate about games. A year and a half after that, I met my ex. It was during this time when I started hanging out with her friends. They pretty much kept away for themselves. Eventually, they moved out of the gaming room to hang out in this quiet corner in the study room in the Commons. The game room was getting noisy with all the new TVs. For the rest of my college years, I stayed and hung out with my ex’s friends, only occasionally popping up in the game room to hang out. Looking back, it was a dampening experience. As I previously mentioned, my ex’s group mostly kept to themselves. That’s because they knew each other before college. They were cousins, siblings, family friends, friends of daughter/son-in-laws, etc. Everyone was interconnected. They also knew (allegedly) everyone’s stories through gossips and back-biting (this would be an appropriate time to do a “hashtag-cliques”). I’m not saying that my gamer friends didn’t have gossip. They did, but not as bad as my ex’s friends. Old habits die hard. If the adults in the families do it, so will their children. It was gossip city. I really didn’t agree with most of these. I stayed for my ex. When we broke up, all her friends took her side. It’s not right, but I don’t blame them. They grew up like that. For the past few years since the break up, I’ve kept myself away from close friendships. The closest friendships I have now are my online friends from social networking, some of whom I’ve met in person. I have a few friends that I hangout occasionally from the mall, but I don’t really consider it as a close friendship. One of the first few friends I met in college is moving to Florida soon. he invited me to a going away party last night along with other people I knew in college, comprising the gaming group. It was nice seeing familiar faces, catching up. We talked about what we’re doing now. I learned one of our friends in the group now works for ZeniMax Online and is one of the lead gameplay designers for the upcoming Elder Scrolls Online. Eventually, that led to discussion about bad movies, TV shows, upcoming movies, gaming and reminiscing past gaming events both funny and memorable. I haven’t laughed like that in a while. As I was leaving the party, I started to feel guilty. It’s an irrational feeling. It sort of felt like I abandoned them by not hanging out with the group on the last few years of college… but not really. To reminisce for a few hours like not much has changed, was a nice feeling. I felt welcomed. I don’t feel the same way when I cross paths with my ex’s friends. The last time I met my ex’s friends was in the mall last year. I didn’t know they were watching the same movie I did. After the movie, we talked for a few minutes and went our separate ways. I walked around the mall, played a few gaming rounds at Dave n Buster and proceeded to head home. On my way to my car, I saw them again eating at a table inside the mall at Buffalo Wild Wings. I thought I’d walk by and say high. As soon as I get there, Kevin, my ex’s best friend’s younger brother mutters “so creepy. like he’s stalking us” as if I didn’t hear that. And that is why I don’t really hang out with them. Sony introduced the first DualShock controllers back in the PlayStation era. It’s basically the same PlayStation control, but slightly bigger, with a vibrating function through the oscillating motor inside and the addition of two analog sticks in the front. The analog sticks also functions as the L3 and R3 buttons when you pressed down. This new controller became the standard controller with new editions of the console. Game developers used the vibrating feature to enhance the game experience (worked pretty well with fighting and survival horror games). They also took advantage of the analog sticks, which simulated real time input from the players. Game characters were able to look in all directions and move at varying speeds with a slight nudge or full motion towards any direction. I thought about ways game developers can make use of analog sticks. As a kid, I used to play Contra with my sister or cousins. They didn’t play the game as much as me and wasted lives (sometimes costing me lives). I imagined how it would be like to control both players by myself. I thought about how cool it would be to control two characters on the screen with each of them tied to each of the analog sticks. The possibilities are endless. 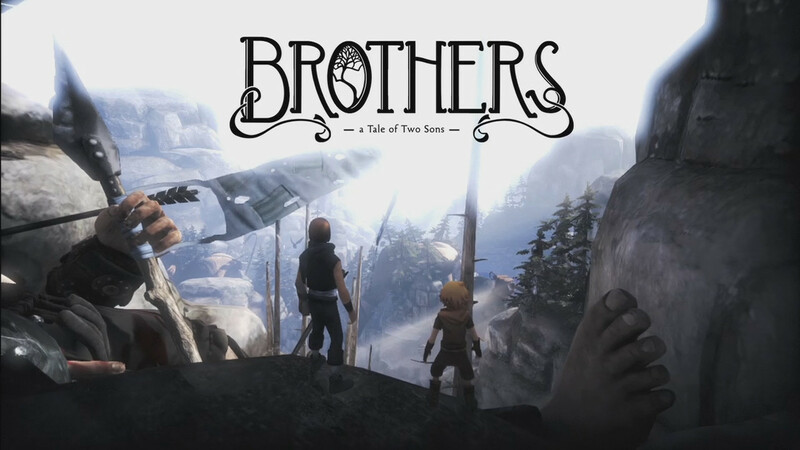 Brothers: a Tale of Two Sons, made that adolescent thought into reality. 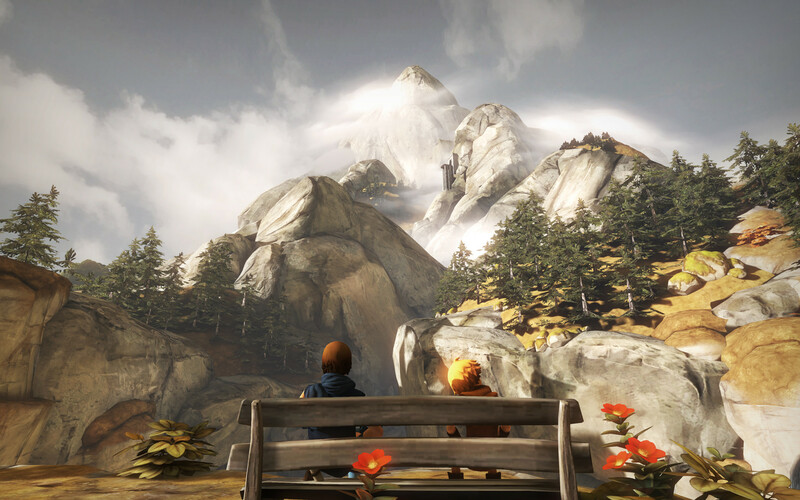 Brothers is a story-driven adventure game. It revolves around the interaction between the two brothers with each other and the world. Players control each brother with one of the analog sticks, allowing each character to move on their own. NPCs will have different reactions when interacting with the siblings. Sometimes, only one of the brothers can get specific info from various NPCs. The story starts with the younger sibling praying at his mother’s tombstone. His mother drowned at sea while he tried to save her. This made him fearful about the outside world, especially swimming. The older sibling calls out for help to get their father to the village doctor. The doctor seems to suggest that the only way to save their father is to go on this long journey outside the village and collect water from this Tree of Life. Now, since I’ve already played the game, I already know what the brothers had to get. During the game, we are oblivious as to what the brothers’ main objective is for venturing out on an adventure. The characters talk in a foreign, made up, unintelligible language. On screen actions and intonations in their voice are my only cues. Throughout their journey, they face the local bully, a farmer’s dog, and wolves. There are optional actions to do like take a ball from a kid to either shoot it in the hoop or drop it in the village well, which makes the kid cry. There is no timer, so these little interactions add to the atmosphere and setting. They also help out others during their journey. 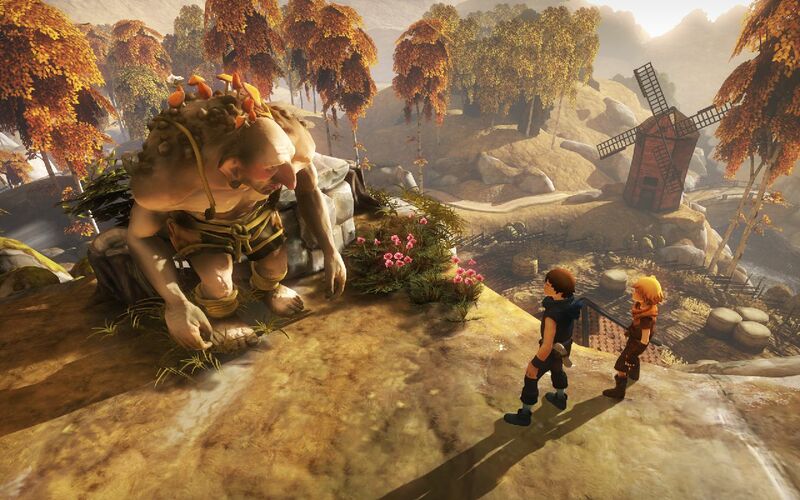 There is a troll that help the brothers hop and climb over hills and inaccessible areas without being thrown (gently). Turns out this troll is looking for a female troll captured by other trolls. The brothers enlist themselves in freeing the captive damsel and reunite the two. Other characters they encounter include a man attempting suicide, an inventor that needs help and a tribal group doing a ritual dance of sort. The story and the controls take center stage. You could feel the urgency and necessity of having both brothers work on puzzles and obstacles, wonderfully interwoven into the story. There’s not much else I could say without spoiling the story, though. It’s a must play game. Last month, I did my review of Final Fantasy XIII. I have mixed feelings about the game. It was much different from previous Final Fantasies and used the new Fabula Nova Crystallis mythology instead of the original crystal origins that the first games used. Linear maps, non-north facing maps (which was a pain), very short story, only one major side quest… the list goes on. Good thing the sequel improved on everything. Final Fantasy XIII-2 is set three years after the previous game. Without spoiling much of what happened, the 6 main characters saved the world. However, something is off. Lightning, one of the main characters is gone. Nobody knows where she is. Many of her friends believe she turned into crystal. Serah Farron, Lightning’s sister, sees things differently. She remembers Lightning being with the group after they saved the world and then suddenly just disappears. The game starts with Lightning in another dimension, Valhalla, in battle gear and different armor. She’s fighting another person named Caius Ballad. During the fight, a portal appears out in the sky. A young man, named Noel Kreiss, falls through. Lightning saves him and tells Noel that she was expecting his arrival. She knows that Noel is from the distant future. She sends Noel on a task to help Serah on saving the world… again. The game pulled a Metal Gear Solid 2 and switched main characters. For the duration of the game, Serah and Noel are the main characters. Noel arrives in Serah’s time, 3 years after the 6 l’Cie heroes saved the world, and tells her that Lightning sent him. Noel explains that the sudden appearance of otherworldly monsters is caused by different timelines bleeding into each other at one point in history, causing a paradox. The only way to fix these is to travel through time and resolve all the paradoxes and find the TRUE timeline. Serah decides to go with Noel and jumped through time using the Historia Crux (it’s the fancy name they call the wormhole to jump through time). That’s pretty much the whole premise of XIII-2. The two main characters have to go through history fixing paradoxes. Along the way, they meet familiar main and supporting characters from XIII. There’s actually more content here than XIII on top of many improvements. One of many complaints from XIII were the linear maps. That’s gone. They expanded the borders on where you can run around, battling monsters and talking to NPC. The non-north facing map? They fixed that by adding an option to make the full map and mini-map always facing north or facing where your character looks. Chocobos are found in all timelines after you’ve completed the story missions in those areas. This makes traveling much easier than XIII. You’re also able to fully explore the game menu unlike in XIII. You can also save anywhere. In XIII, it was possible to completely ignore appearing monsters by running away from them and catching them completely off-guard with their backs turned and abuse staggers. Not anymore. When monsters appear, a color-coordinated timer appears counting down from green, to yellow then red. You have the chance to hit any of the monsters with your weapon before the timer runs out and get a preemptive strike. However, these preemptive strikes don’t almost stagger the monsters. You can run away from the monsters and the timer disappears. if you don’t hit them or them hitting you before the timer runs out to red, you won’t be able to restart the battle. In battle, you have a chance to obtain monster crystals from monsters you’ve defeated. You can use these monsters as pets and your third character during battle. Like your two main characters, they can be leveled up and obtain more powerful skills and more health. You can also infuse one monster to another monster. The other monster would gain any available ability from the consumed monster. Another game mechanic they changed is the ability to switch leaders during battle. This was not possible in XIII. When the leader dies, it’s game over. Not in XIII-2. When the leader dies, it automatically switches to either Noel or Serah. They also added this feature for paradigm shifts: (1) Normal, Cross (X) or Wide paradigms. Paradigms with X have the characters focus on one target. Wide paradigms focus on all targets. You can also save up to three paradigm shift setups. This makes setting up for specific boss battles easier and it’s as easy as loading your go-to shifts. XIII-2 played similarly to another numbered sequel (X-2)… in that you can choose the order you play each timeline or branching timeline. You don’t even have to play all the timelines to beat the game. I know some people play the game like that, but they miss out on everything. When interacting with certain NPCs and various story points in the game, there is a trigger event that lets you choose an answer, which garner serious, honest or funny reactions from the characters. Any variations of these will net you decorations for your monster pets. There lots of these collectible items. They’re unnecessary for completing the game, but it’s fun to dress up your monsters. XIII had you collecting monster drops and pawning them off to shops as the main source of money. Not in XIII-2. This time, monsters actually drop gil, as well as monster items and equipment. Can’t get enough of side quests? XIII-2 has got you covered. Collecting monster decorations, fully exploring every map from all possible timelines, optional bosses, gambling and chocobo racing. These will keep you busy. These don’t even include the downloadable content (DLC) you have to pay, which are a lot, and which Square Enix is guilty of abusing. There’s a colliseum DLC, which have you fighting strong monsters and familiar characters from XIII. Beating these guys will net you their monster crystal. That’s right. You can have Sazh, two version of Lightning and Snow as support characters. From a gameplay standpoint, these DLCs were fun to beat. They don’t really add much to the story, but they sure help out with beating the game. Too bad I already beat the game before I attempted to fight them in the colliseum. You can get Sazh early on by playing his own DLC. In this story, he was also affected by the paradox. He and his son, Dajh, wind up in the Serendipity dimension, where everyone can gamble. You can play poker and this other gambling game having to do with a clock or something. Beating the requirements for this DLC gets you Sazh’s as a supporting character. The last DLC is the important one, as it bridges the story at the end of XIII-2 and the third game, Lightning Returns: Final Fantasy XIII. In this DLC, you play as Lightning wearing Etro’s Goddess armors or whatever. You fight Caius Ballad one on one. It’s probably one of the hardest DLCs I’ve had to play. Normally DLCs are freebies and much easier than the main game content. Square Enix didn’t get the memo and is basically making you pay extra for a harder difficulty. Because Japan. Square Enix did everything right in my book. From what I heard, this was supposed to be just one game, but it got too big to fit in one Blu-Ray disk that they have to split it into two games. Not sure if that’s true or not, though. The only thing I didn’t like is having to play another game to find out the story of the Lightning Saga. I already ordered it, but the seller is waiting on a back order delivery of another item before they can ship this. Gives me more time to play other games, I guess. Building the Nanoblock Great Pyramid of Giza set. This was the most meticulous set I’ve built. Lots of parts. But worth it. 1. It’s been a while. I had a few posts lined up about several games I recently played and completed. Just didn’t have time to write. 2. I completed another Nanoblock set for the Great Pyramid of Giza. I recorded the video of me assembling it. I was thinking of adding the timer while editing the video, but the script is not fully compatible with my software. It shouldn’t be much of a problem. I’ll just need the right music to go with it. 3. I got a postcard from my friend from London. I don’t get many post cards so there’s that. Cool. Cool cool cool. 4. Today is my birthday. Thirty. The big 3-0. And I still got carded at the restaurant for my birthday dinner on Sunday. It was the first time I drank since August last year. Two glasses and a bottle of red wine. Dry aged steak. Lava cake. 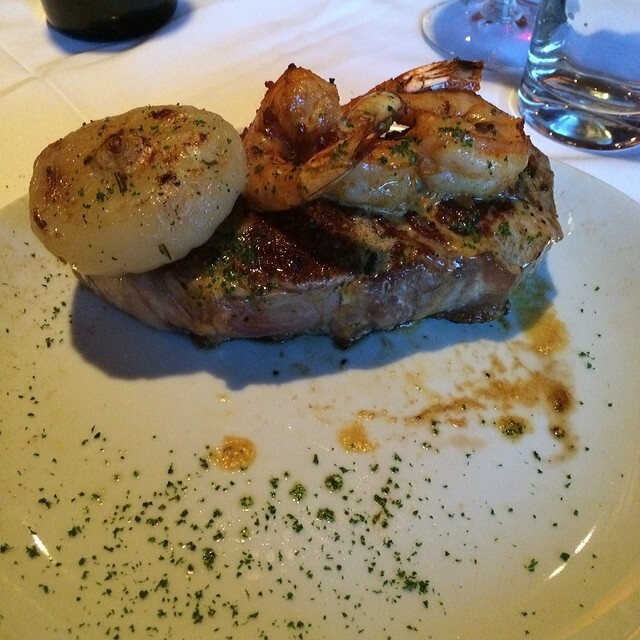 It was an expensive dinner, but my parents justified it, being my 30th birthday and all.